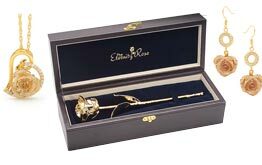 At The Eternity Rose, we are serious about our warranty policy. We don’t just see this policy as a register of conditions published on our website. We are committed to supporting our customers whenever an item is deemed defective in any capacity. Our 90-day money-back Satisfaction Guarantee offers our customers the luxury of returning any product for a full refund or replacement before 90 days from the invoice date has expired. 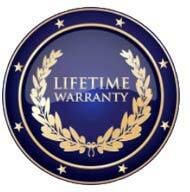 Our warranty for product failure is backed by guarantee, which offers you security and reassurance. You are guaranteed a replacement if any item should fail under normal circumstances of display. 1) The product has evidently been dropped, bent, or has incurred any other noticeable damage or breakage. 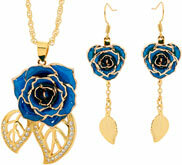 2) Standard tarnishing of products that contain a precious metal (gold, silver, platinum). 3) The product shows evidence of corrosion, resulting from contact with an acidic chemical. If you have any need to contact us to make a return claim under our warranty policy, we will treat your claim with priority and urgency. 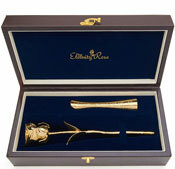 All products of The Eternity Rose will endure for a lifetime under normal and internal display conditions. For all precious metal products, some tarnishing tends to occur over time. 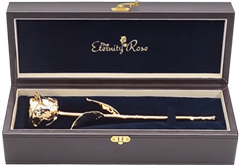 It is recommended that consumers apply a light metal cleaner at least once every five years to sustain the lustre of their Eternity Rose product. Our rose products possess the structural strength of a wine glass, thus consumers should aim to polish them with the same degree of rigor. If you want to return a product, please see our sections on Returns Procedures. 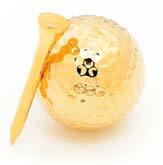 Playable poker cards, golf balls and tees will show natural wear and tear under active use. This is also not covered by our warranty policy.